In ca. 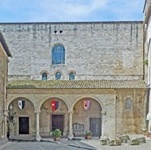 376, St Juvenal, the first Bishop of Narni, was buried just outside the city walls of Narni, on a site near the right wall of the present church. His successor, St Maximus (died 416), is reputed to have built an oratory over the grave. Later bishops were buried here, including St Cassius (died after 558), who was buried with his wife, Fausta. Adalbert I, Margrave of Tuscany sacked Narni in 878 after he had participated in an attack on Rome in an effort to force Pope John VIII to crown Carloman as Holy Roman Emperor. He destroyed the oratory and stole the relics of SS Juvenal and Cassius, which he took to Lucca. The political situation eased when Carloman died in 879, and John VIII reached agreement with his successor, Charles the Fat. Adalbert received absolution in 880 on condition (inter alia) that the relics of St Juvenal should be returned to Narni. An oratory (later known as the the Sacello di San Cassio) was rebuilt against the city walls and the relics were buried in the rock below it, for reasons of security. In 1047, work began the present church, which was built outside the city walls, so that the Sacello di San Cassio opened into the right wall of its nave. Construction was interrupted in 1053 when the site was flooded. It seems from an inscription on the facade (see below) that the church was not completed until ca. 1120. Pope Eugenius III, who was elected at in a period of anti-papal rebellion in Rome, visited Narni in February 1245, a few days after his consecration in the Abbazia di Farfa. (He was then forced to take refuge at Viterbo until the Christmas of that year, when he managed to take up residence, albeit briefly, in Rome.) 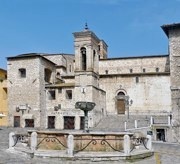 While in Narni, he consecrated the Duomo, as well as the “oratorium Sancti Juvenalis” and a Marian altar. The entrance to the church is in Piazza Cavour. The blank wall to the right belongs to the new fourth aisle that was built between the original right wall and the Roman city wall in the 14th century. The campanile can be seen from Via del Campanile (see Walk I). It comprises a sandstone base (12th century) from the original church and a brick upper part (15th century). ✴The arms on the architrave are those of: Cardinal Berardo Eroli; the Cathedral Chapter; the City of Narni and Bishop Boccardi (whose tomb is in the 2nd chapel off the right aisle). ✴The entrance to the Cappella dei Muratori, which belonged to the stone masons' guild and which now serves as the baptistry, is inside the portico, on the right. ✴The inscription above the lunette records commemorates the construction of the loggia and gives the date. The left arch of the portico was sacrificed in 1832 when a road was built here to connect Piazza Garibaldi and Piazza Cavour. The facade was re-modelled in the mid 14th century, although the masonry from the three original portals was re-used. The surrounds of the central portal are finely carved. 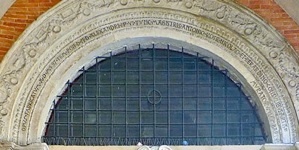 The Latin inscription on the architrave over the portal on the right, which is in Leonine verse, records that the priest Lupus renovated it in the year “MILLENI CENTVM REPLICATIO DENIS”: the last two words probably mean “ten replicated” - i.e. the date is 1120. The architrave could well have come from the entrance to the earlier oratory, and the construction of the new church must have been largely finished by the time it was restored and reused. The inscription across the wooden door here records the Jubilee of 1750.